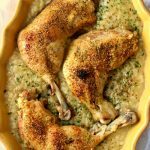 Instant Pot Chicken and Brown Rice–whole chicken legs are seasoned and cooked until tender in your electric pressure cooker and then browned under your broiler. Brown rice is cooked alongside the chicken and comes out with a creamy consistency–almost risotto-like. And no cream of soups are used in this recipe! When I was growing up one of the recipes that my mom would make was chicken and rice. I believe it had rice, water, chicken, cream of mushroom soup, salt, pepper and paprika in it. It was one of the recipes I took with me to college and made when I was married too. I’m sure you’ve had something similar, right? Well this recipe for Instant Pot chicken and brown rice brings back memories from that dish but it is 10 times better. First off, you don’t use any cream of soups. Second, you use hearty and healthy brown rice. Third, it is cooked in your electric pressure cooker which ensures that the chicken comes out totally tear apart tender. When I decided to make a chicken and rice recipe for the instant pot I knew that the ingredients had to match up. Meaning that the type of chicken I used would have to match the type of rice I used. For example, brown rice takes about 22 minutes to cook but chicken breasts only take 10 minutes to cook. 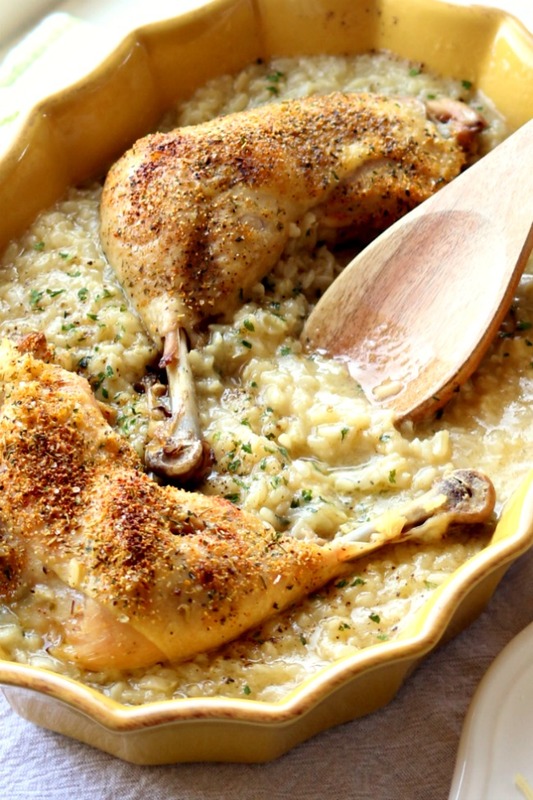 Arborio rice (typically used for risotto) takes 10 minutes to cook but bone-in chicken takes 25 minutes to cook. Do you see what I’m saying? I went with bone-in whole chicken legs and a brown rice risotto. These both take about the same amount of time to cook in the Instant Pot. It was a match made in heaven. I know there are many of you that would prefer to cook with boneless chicken but believe me for this recipe you need to stick with bone-in chicken. The chicken legs release flavor and juices while they cook to produce a flavorful rice. 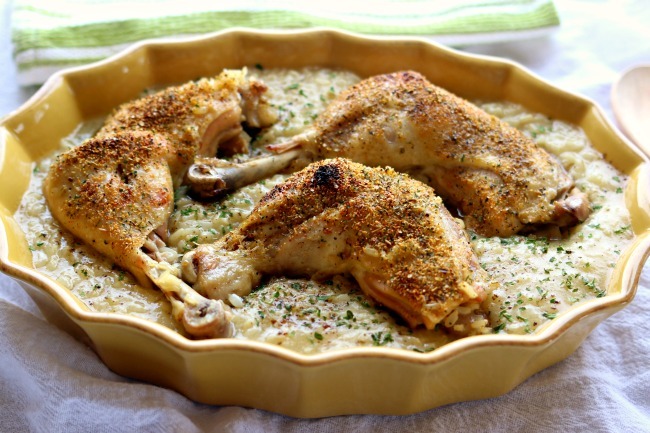 I loved crisping up the top of my chicken legs in the oven under the broiler. The skin gets all brown and crispy and delicious. And it only takes an extra 5 minutes…totally worth it. For Instant Pot Chicken and Brown Rice I used my 6 quart Instant Pot Duo 60 7 in 1*. I also own the 6 quart Instant Pot IP-LUX60 V3 Programmable Electric Pressure Cooker. * They are both great pressure cookers! The first one I mentioned has a yogurt making function but other than that they are fairly similar. The price difference between the two is about $20. I recommend buying the Duo. Whole chicken legs are seasoned and cooked until tender in your electric pressure cooker and then browned under your broiler. Brown rice is cooked alongside the chicken and comes out with a creamy consistency–almost risotto-like. And no cream of soups are used in this recipe! Heat your Instant Pot on the saute “more” setting until it says HOT on the display. Add in the oil. Add in the diced onion. Saute for 3 minutes. Add in the garlic and saute for 1 minute. Add in the chicken broth and scrape the bottom of your pot. Add in the rice and salt. Lay your chicken on top of the rice. Sprinkle 1 teaspoon of the Montreal chicken seasoning on top of the chicken. Cover your pot and lock the lid into place. Make sure valve is set to “sealing.” Set the manual button (or pressure cook) button to 25 minutes. When the timer beeps let the pot sit there for about 15 minutes. Remove any pressure by moving the valve to venting. Turn your oven to the broil setting and move the rack to 6-8 inches below the heating element. Carefully remove the chicken from the Instant Pot and place it on a sheet pan. Sprinkle the chicken liberally with more of the Montreal chicken seasoning. Put the sheet pan in the oven and let the chicken get crispy on top. This will take about 5 minutes, maybe a little more. I like to rotate my pan halfway through. While the chicken is getting crispy, turn the Instant Pot to the saute setting and stir in the butter and parmesan cheese until it is melted. Stir your rice until it reaches desired consistency. Salt and pepper to taste. Serve chicken on top of the rice. Here is the SLOW COOKER version of this recipe. So my chicken was still frozen how much longer do you think it would take? I’m new to the instant pot but loving it so far. I’ve seen lots of recipes where the meat is still frozen, is it ok with this recipe? Yes, it should be fine. I use frozen chicken all the time! I made this last night in the instant pot, hands down one of the best pieces of chicken I’ve had in a long time. The rice was great and I paired it with some roasted squash, zucchini, tomatoes, and mushrooms. Thank you for the great recipe. I will be putting this in my recipe book to make again! Wow I’m so happy to hear this Virginia! For whatever reason, this did not work at all for me. I use my IP 3-4x/week, so that was a shocker that this didn’t hit 100% right away, I am a veteran plus this is very easy. I’m already 45+ minutes longer on cooking, the rice is done, the chicken is raw (25 minutes, plus 10 extra, plus water plus 10 more minutes, plus water plus 15 more minutes, under way right now). Brandon, this is so weird! I have no idea what could have happened. I don’t imagine it was this??? Mistake: Some new users have mistaken the “Timer” button for setting the cooking time, then wondered why the Instant Pot is just sitting there not doing anything. The “Timer” button is actually for delayed cooking. So could I assume that bone-in thighs would substitute equally? Yes that would be very good. Made this tonight for our inaugural use of our new Instant Pot 8 quart and it was delicious. Thank you for the recipe. Hooray! I’m so glad you got an Instant Pot. I made this tonight and it was wonderful! I used a no-salt Italian herb seasoning and added a little more salt than the recipe called for (to make up for not using the Montreal seasoning, which has salt in it). The rice was a little runny when it was finished, but it absorbed the liquid after a few minutes. 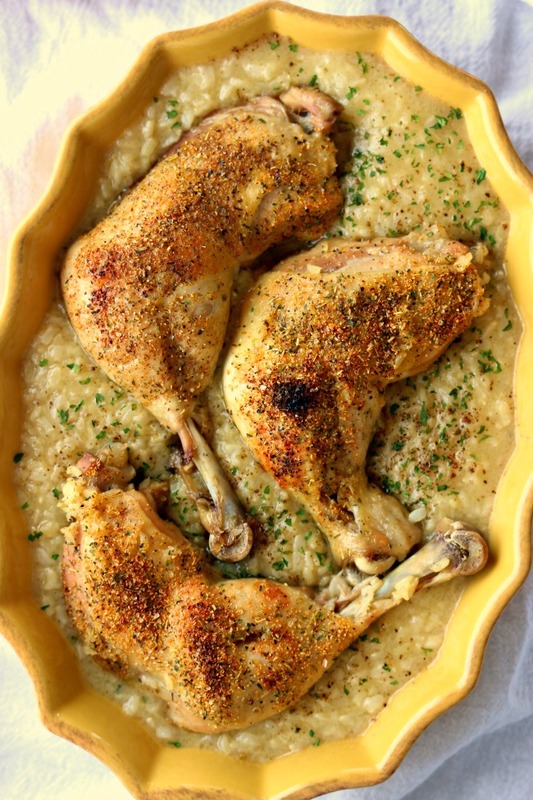 It was creamy rice and wonderfully done chicken with crispy skin–what could be better! GREAT to know! Thanks Lisa. The rice would get overcooked or the chicken wouldn’t be done in time. You’ll have to use chicken breasts that would cook in the same amount of time as the rice. Use a 1.5 water to 1 rice ratio. Cook for 8 minutes and then a 10 minute NRP. Let me know how it turns out! Looks yummy. Would 4 bone-in, skin-on chicken breasts work? Would the time still be 25 min? Looks so delicious! Would it be possible to add done sliced mushrooms as I’m sauteeing the onions? Or would that add excess liquid to the recipe? Thanks! Personally I think that would be amazing!! Try it! So, if one were to use chicken breasts and Arborio rice, would you just cook it for 10 minutes? That is what I think you are saying. Okay, yes that is what I’m saying. I haven’t tried it so I can’t say for sure how it would all turn out but I think it would work! Here is what I’d do. 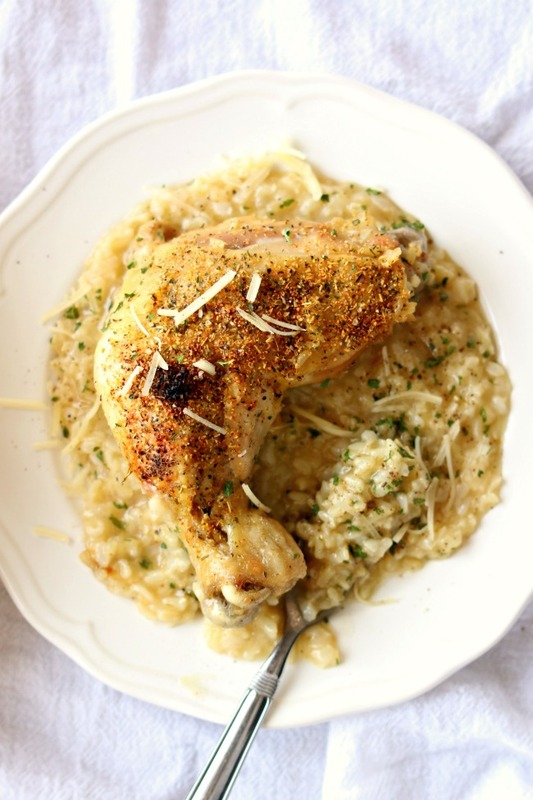 I’d follow this recipe: https://www.365daysofcrockpot.com/instant-pot-parmesan-risotto/ and add the chicken brest on top and season with the Montreal seasoning. Manual for 10 minutes with a 10 minute NPR. That is so funny. Literally seconds after commenting, I found that other recipe and made it for dinner last night. Everyone loved it (except my miserable child who doesn’t like her rice mixed with anything.) Also, I sautéed some broccoli in olive oil and garlic, and tossed it on top of the risotto after shredding the chicken. It was DEEELISH.